This is the base cone 6 Ravenscrag recipe, it fires as a transparent glossy. It has an addition of the most common North American borate frit, enough to produce a good glass at cone 6. Most other glazes based on Ravenscrag use this as a starting point (although they might substitute the frit for another). The character of this is not the same as transparent glazes made from materials like feldspar, kaolin, silica, wollastonite and frit. This is a natural clay material having some iron content and particles you can feel (up to 42 mesh). So it forms a less sterile glaze, one having some variegation, fine speckle and slight blush or amber coloration. It is most glossy at a complete cone 6 (for a lower temperature you may need to increase the frit a little). As a transparent, this glaze it is best suited for use on light-burning stonewares (e.g. Plainsman M340). On whiter porcelains it will not fire to a sufficiently transparent glass. For porcelains or white stonewares consider using G2926B or G3806C instead. On darker clay bodies this recipe may fire too cloudy. Is has a low enough thermal expansion to fit most bodies, but if it does craze consider substituting the Ferro Frit 3195. As noted, this is a base recipe, well suited to additions of opacifiers, variegators and colors. Add zircopax to get a white (about 10%). The white produced will be somewhat variegated (non toilet-bowl-like). For variation-with-thickness, to highlight edges of contours, use a lower percentage of zircopax. For even better variegation, add some titanium dioxide (1-2% to a mix already containing 6-8 zircopax). Add colorants and variegators (with or without opacifier). If colorant additions affect melt fluidity, add or reduce the frit content to compensate. 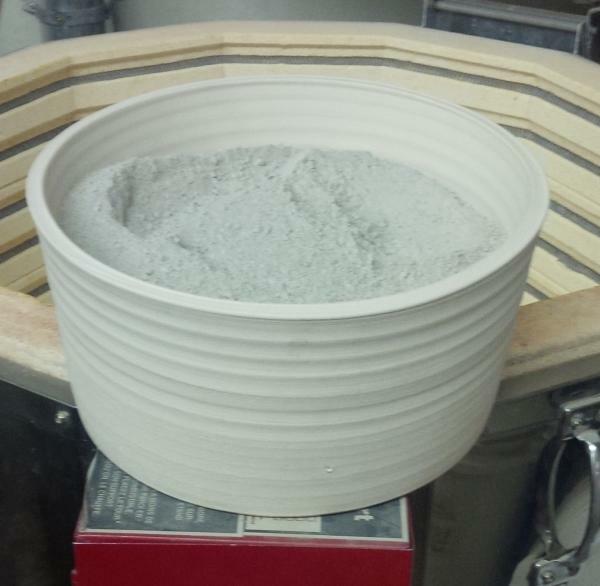 If it cracks during drying, increase the roast clay at the expense of raw clay. Glazes having a high percentage of Ravenscrag Slip are most often prepared using the traditional method of simply adding water until the preferred viscosity is achieved (the material has inherent properties that produce functional slurries for dipping). Control of drying shrinkage and slurry character is achieved by varying the proportion roast and raw powder in the recipe. For us, a weight ratio of 80 water to 100 powder (2000 water for 2.5kg of powder) produces a 1.5-specific-gravity slurry that, although fairly runny, gives the right thickness on 1-2 second dip on 1850F bisque-ware (there is some dripping, but coverage is even and it is quick drying). This recipe actually does not respond to flocculant additions that gel traditional mineral-blend glazes to a thixotropic state. 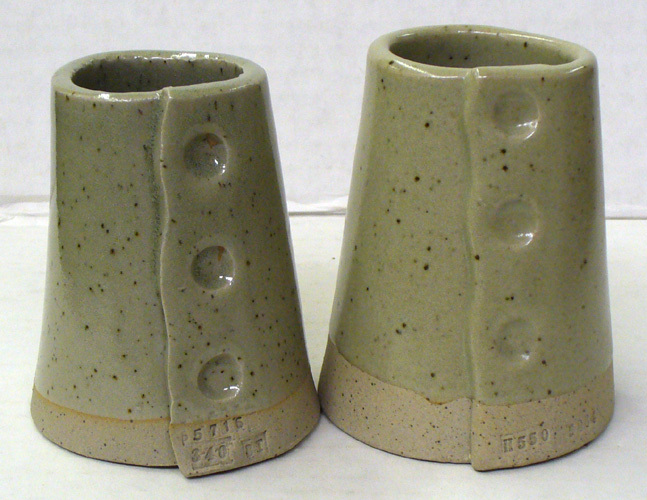 Cone 5 GR6-A glaze at cone 5R on Plainsman M340 (left) and pure Ravenscrag Slip at cone 10R on H550 (right). 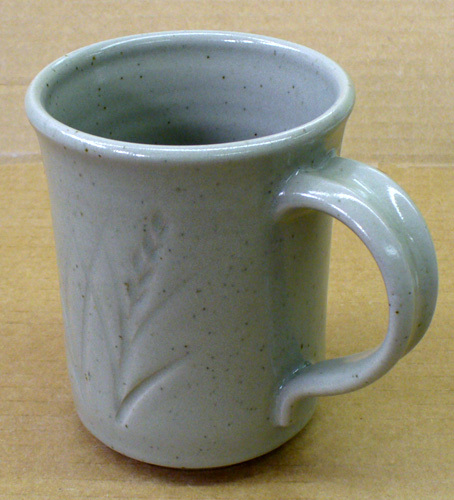 The mug is the buff stoneware Plainsman M340. Firing is cone 6. 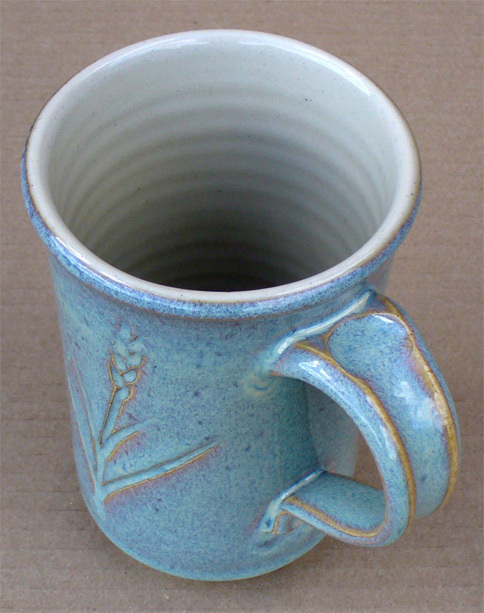 On the inside is the GR6-A Ravenscrag transparent base glaze. The outside glaze is GA6-C Alberta Slip rutile blue on the outside. The transparent, although slightly amber in color compared to a frit-based transparent, does look better on buff burning stoneware bodies this.